MITOTANE CHEMOTHERAPY: Appropriate studies have not been performed to find out Mitotane’s safety or effectiveness in children. ETOPOSIDE CHEMOTHERAPY: Side effects: Leukemia, Nerve Damage, Inability to Fight Infections, Vomiting. CISPLATIN CHEMOTHERAPY: Side effects: Kidney Damage, Hearing Damage, Nerve Damage, Infertility, Vomiting. My uncle Ray told me that for the last few weeks of my cousin’s life, they celebrated Christmas once a week. They had a Christmas and a birthday once a week until that was it. I was putting myself in his shoes, and I was just thinking, I couldn’t watch my daughter whither away, and at least I wanted whatever time I had to be happy. As happy as could be anyway—and not just watch her whither away from chemo that’s not doing any good any more. MITOTANE CHEMOTHERAPY: Approved: July 8, 1970. Derived from DDT (insecticide). … I just thought, well, this is ridiculous. It felt to me like they were grasping at straws. I was doing all that research and Sarah and Susan found the Burzynski Clinic. Sarah said “I want to take her there.” I looked at it like, well, if she’s only got approximately 9 months to live, and we come over here and we don’t have all the side-effects… well, in 9 month’s time, which am I going to be better off doing? If the ending results is the same? Upon the removal of Kelsey’s left kidney and left adrenal gland, her diagnosis was confirmed at the University of Texas Medical Branch, and again at M.D. Anderson cancer center. Where, a month later, M.D. Anderson also confirmed that Kelsey’s cancer had spread to her lungs. After desperately researching Kelsey’s situation, her family decided to decline all chemotherapy treatments offered my M.D. 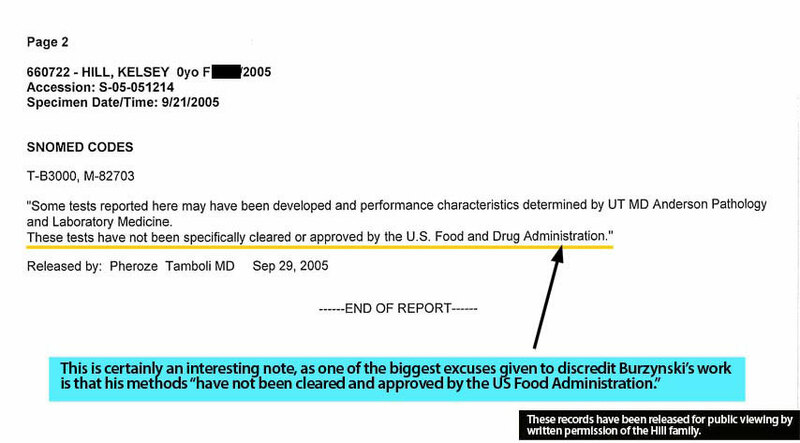 Anderson, and instead, enroll Kelsey into one of Dr. Burzynski’s clinical trials. 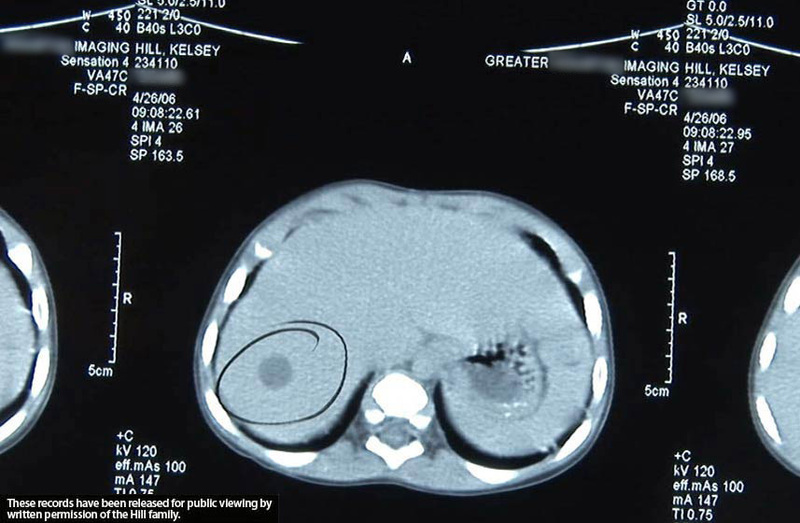 By this time, Kelsey’s cancer had also spread into her liver. After starting her Antineoplaston treatment, the tumor in Kelsey’s liver was gone by August of 2007. 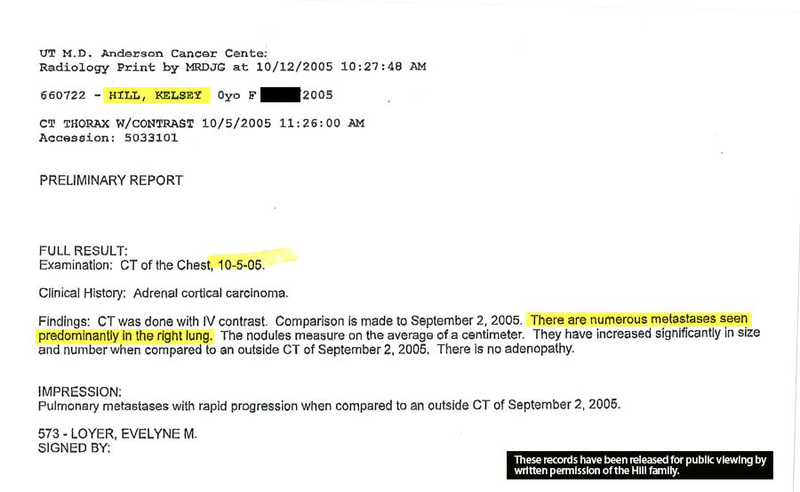 CT scans of her chest revealed six tumors in her lungs at the start of treatment. One-by-one, the tumors in Kelsey’s lungs began to go away, leaving one small spot four years later which was deemed to be inactive and most likely scar tissue. 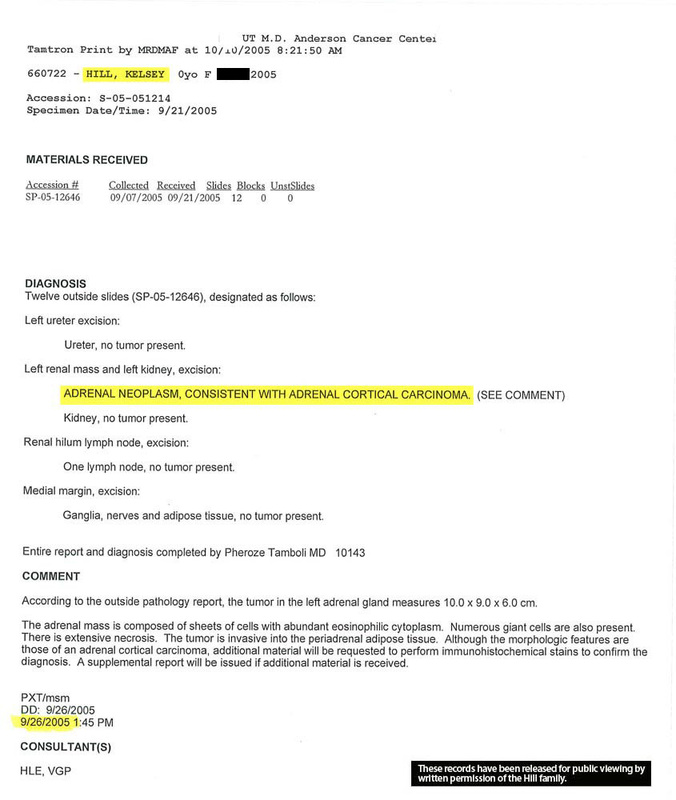 Today, Kelsey Hill is considered to have had a complete response to her Antineoplaston treatment.